The ten Regional Educational Laboratories (RELs) work in partnership to conduct applied research and trainings with a mission of supporting a more evidence-based education system. Learn more about the REL Pacific region. Join us for a roundtable discussion at the 2019 Comparative and International Education Society Conference to learn about REL Pacific's approach to research-focused partnerships. The presentation provided participants with information on needs-sensing and an example of how REL Pacific's Toolkit of Resources for Engaging Families and the Community as Partners in Education was implemented in Guam. This presentation focused on how stakeholders in Kosrae are approaching the development of a language education policy through the use of an implementation science framework. 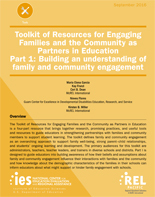 This toolkit provides resources for school staff to build relationships with families and community members and to support family well-being, strong parent-child relationships, and students' ongoing learning and development. In this REL Pacific video, educators and administrators discuss how to support Micronesian students in Hawai'i through family and community engagement. CNMI stakeholders have identified college and career readiness as a high priority. In December, REL Pacific staff traveled to Kolonia, Pohnpei to begin to collaboratively design a high school math transition course. The size and diversity of the REL Pacific region can pose a challenge to conducting research and providing technical support.